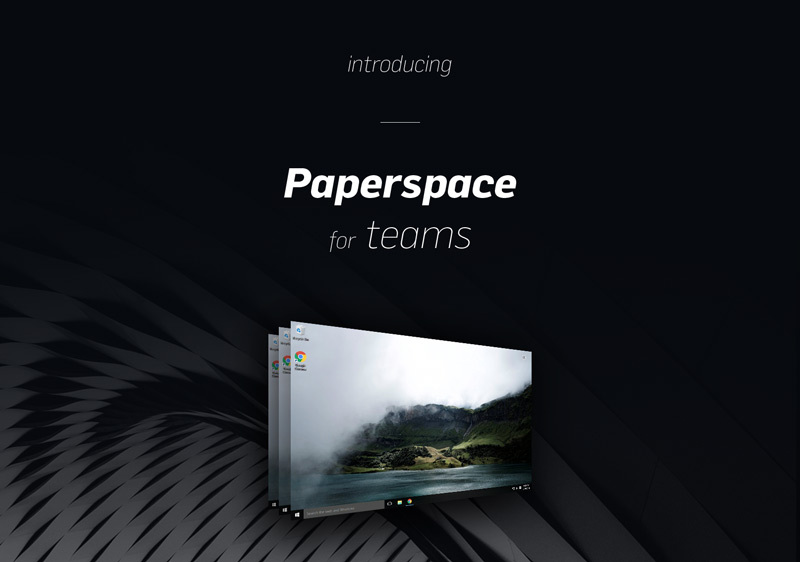 Paperspace public launch & Paperspace for Teams! We are excited to finally announce the general availability of Paperspace. Starting today anyone can sign up for a cloud computer by going to www.paperspace.com and creating an account. When we first announced Paperspace, we had no idea how deep of a nerve we would strike. On day one we had over 12,000 signups. Today, Paperspace is used by individuals doing practically everything you can imagine from genomics, to gaming, to designing 3D worlds in CAD. Our vision was to reinvent the desktop computer and we have been working nonstop for over a year now to perfect our streaming algorithm, design our web interface, and crucially, to add server capacity to support an ever bigger audience. As we continue to grow Paperspace has had to evolve to accommodate larger and larger deployments. Today we’re thrilled to announce that we’re officially launching Paperspace for Teams, the next major version of Paperspace! Early on we realized that teams were using Paperspace differently than individuals. They are heavy collaborators, they need to connect offices to each other and they need tools to manage large deployments. Quite simply, more people = more complexity. So, we hunkered down and spent the last several months collecting feedback from our users and built a product tailored specifically for Teams. With this new offering, Paperspace is ready to take on any size deployment from a 5-person office to a 50,000 enterprise. This is just the beginning and we have lots in store for the next few months (from gaming to ML and much more). Subscribe to our blog to get all the latest announcements.